Milton holds degrees from the University of Toronto, Ryerson University and the University of Guelph. A registered dietician, he is also an avid mountain and long-distance cyclist. His writing has appeared in Oxygen Magazine, Canadian Living, Vegetarian Foods and ALIVE. Folic acid is the synthetic form of folate, also known as vitamin B-9. To maintain the necessary levels of this vitamin, you need to consume folate daily because it is water-soluble and excreted in urine. Too little of this vitamin, and you can develop a deficiency. One symptom of deficiency is a swollen tongue and mouth sores. In addition to a swollen tongue and mouth sores, you may also become tired, develop gray hair, experience diarrhea, develop peptic ulcers and experience poor growth if you have low folic acid levels. The combination of swelling and oral ulcers can lead to discomfort in your mouth, making your tongue feel sore. Folic acid deficiency can be caused by a number of factors, including eating overcooked vegetables and drinking too much alcohol. 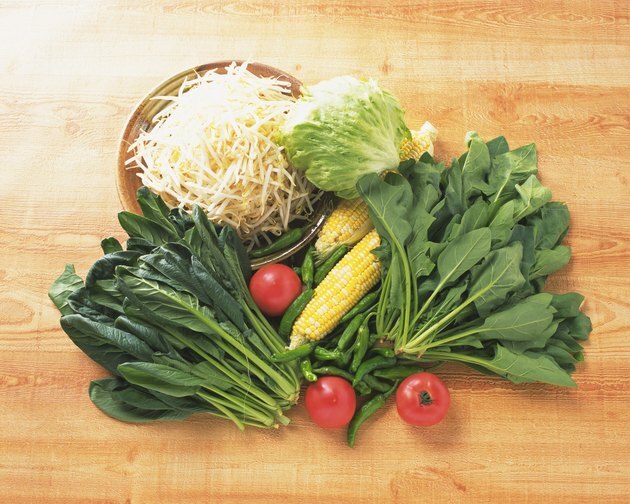 A diet that is not rich in fruits and vegetables can also lead to a folate deficiency. Chronic diseases, such as Crohn’s disease, can cause poor folic acid absorption in the digestive system, which can also lead to a deficiency. Low folate levels are diagnosed with a blood test. If left untreated, low folate can result in a low red blood cell count, and, in extreme situations, low white blood cell levels. The recommended dietary allowance of folic acid is 400 micrograms for adults. Women who are pregnant or breast-feeding require more per day, with the RDA rising to 600 and 500 micrograms, respectively. Folate is found naturally in dark green leafy vegetables, such as kale and spinach; legumes, such as chickpeas and lentils; and in citrus fruits and juices. It is also often added to grain foods, such as cereals, flours and pastas. Folic acid can be taken as a supplement, and the University of Maryland Medical Center recommends you take it as part of a multivitamin because folic acid needs other B vitamins in order to work. As with all B vitamins, folate helps your body transform carbohydrates into glucose, or usable energy for your body. It is also needed to maintain healthy skin, hair and eyes, and it provides support for your nervous system. In addition, folate is vital for healthy brain function and assists with the creation of your body’s genetic material, which is why it is so important for pregnant and breast-feeding women. Folate also helps in the production of red blood cells. What Causes High Folate Serum Levels? Does Folic Acid Stimulate Hair Growth?